Currys Sale is now on across everything. With up to 40% off and price match guarantee, you don't want to miss it! Now owned by Dixons Retail, British electrical retailer Currys was founded in 1884 and specialises in home electronics and household appliances. In 2006, Dixons stores rebranded as Currys digital and some UK stores have dual branding with the PC World name. Offering exceptional value, this brand has constant special offers and stays abreast of the latest tech so the newest products are always available. Find all your electrical needs under a single roof, from computing and related accessories to audio and sat nav equipment, cameras and TVs, and from smaller appliances like irons to larger items like fridges and washing machines. 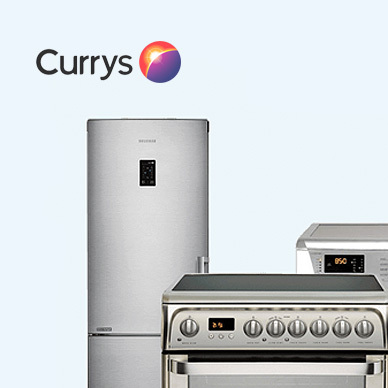 Add Currys to your Favourites list and be the first to know every time they have a Sale on! 1st January 2018 - Currys New Years Day sales for 2018. 7th May 2018 - Currys Early May Bank Holiday sales for 2018, add to your diary now! July 2018 - Currys Summer 2018 sales, joining us? 23rd November 2018 - Currys Black Friday sales in 2018 start on Friday 24th November. Add products from Currys to your Love Sales list. Get the Love Sales button now! Currys January Sale is now on across everything. With up to 40% off and price match guarantee, you don't want to miss it! Currys Cyber Monday Event has started early, and whats even better if they lower the price before Black Friday they will refund the difference! Currys Black Friday Event has started early, and whats even better if they lower the price before Black Friday they will refund the difference! Enjoy 40% off this October across 100s of products instore and online! Enjoy 40% off this September across 100s of products instore and online!